Moving the Needle: Jonathan Lucroy gives the Brewers the lead in the eighth, +.550 WPA. A little inside-out swing is all it took. 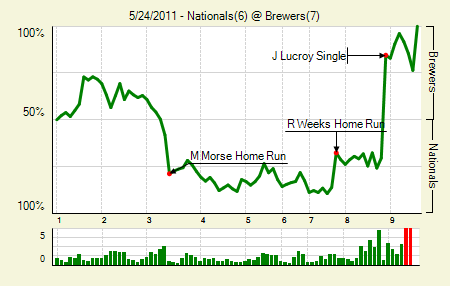 Lucroy’s bloop hit the foul line and, to the Brewers’ benefit, did not bounce into the stands. It allowed the trail runner, Brandon Boggs, to score. The throw actually beat him, but Wilson Ramos could not hang on. That put the Brewers up 7-6, and John Axford would come on to save the win. Lucroy also hit a solo homer in the game. Corey Hart: 2 for 4, 1 HR. That’s four homers in two days for Hart. He’s just a bit better fit in the two-hole than Carlos Gomez. Mike Morse: 3 for 5, 1 2B, 1 HR. Nothing much really to say; it’s been kind of a blah season for Morse. Moving the Needle: David DeJesus gets things started with a solo homer, +.120 WPA. Elite pitchers avoid the big inning. Dan Haren did that last night against the A’s, but he also allowed runs in three different innings, the second through the fourth. After his solo homer in the second inning, DeJesus then came back with a two-run shot in the fourth to make the score 5-0. Guillermo Moscoso: 6 IP, 3 H, 0 R, 3 BB, 3 K. That was his first career start; he had made 11 relief appearances prior to last night. It’s not as though the A’s are getting Brandon McCarthy or Dallas Braden back any time soon, so good on Moscoso for stepping up in his first turn through the rotation. Josh Willingham: 1 for 4, 1 2B. 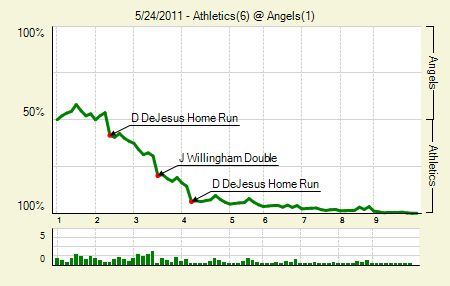 DeJesus drove in four of the A’s runs, and Willingham got the other two with a double in the third. Moving the Needle: Lou Montanez starts the carousel in the second, +.138 WPA. 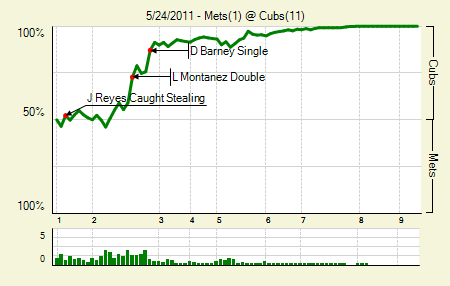 After going down 1-2-3 in the first, the Cubs absolutely broke out against Jonathon Niese in the second. A pair of singles put runners on first an second for Montanez, who inside-outed a double down the right field line. The hit brought around the first of the inning. An error helped scratch along another, and then, after a sacrifice and a walk loaded the bases, a pair of singles added another three runs, setting the foundation for the drubbing that continued throughout the game. Ryan Dempster: 7 IP, 7 H, 1 R, 1 BB, 5 K. Nice bounce back after getting smacked around against Florida last time out. Starlin Castro: 3 for 5, 1 3B. That’s four multi-hit games in his last six. He’s hit for an extra base in five of his last seven. Moving the Needle: Felix Pie ties the game in the ninth with a double, +.417 WPA. 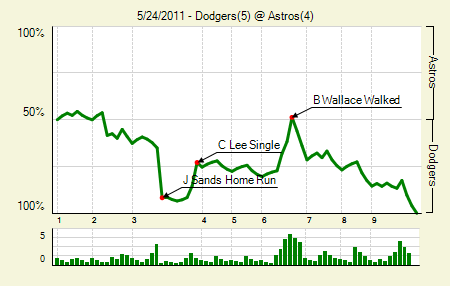 The Orioles went down 3-0 in this one, but they got back a pair in the sixth, and then rallied to win in the ninth. 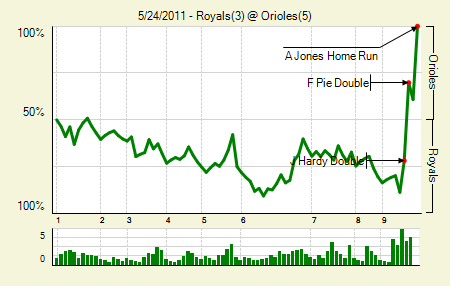 J.J. Hardy started the rally with a one-out double, and Pie followed with a double down the third base line to tie it. Two batters later, and with two outs, Adam Jones ended it with a homer. Alex Gordon: 2 for 5, 1 HR. It’s still odd to see his name penciled into the leadoff spot. He slumped for a bit, but he’s had a hit in his last six games, going 7 for 21 with a double and two homers. J.J. Hardy: 2 for 3, 2 2B, 1 BB. Remind me again why the Twins traded him. Moving the Needle: Melvin Mora brings home a pair with a double, +.148 WPA. 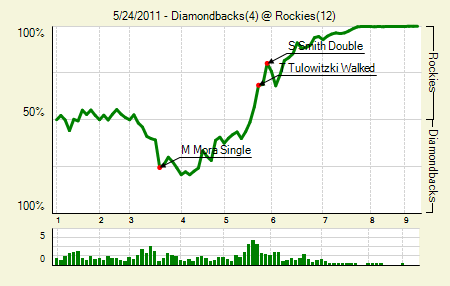 This game got out of hand by the middle innings, but the DBacks picked up some early runs. A bases-loaded fielder’s choice got them their first run, and the next two came when Mora singled in the runners on second and third. The Rockies, though, would hit two solo homers in the fourth, and then add three more in the fifth to take the lead for good. Carlos Gonzalez: 2 for 4, 2 HR, 1 BB. He’s been slowly brining up that wOBA, but this gave it a little acceleration. Seth Smith: 2 for 5, 1 2B, 1 HR. 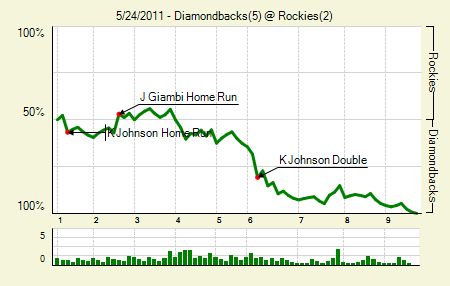 Moving the Needle: Kelly Johnson extends the DBacks lead, +.125 WPA. Johnson got things started with a solo homer in the first inning, and then delivered the big hit, in terms of WPA, when he added a run to the Diamondbacks’ 2-1 lead. The DBacks would add another pair in the inning to put a bow on the second game of the twin billing. Joe Saunders: 8 IP, 6 H, 2 R, 1 BB, 4 K, 1 HR, 12 GB. His last two starts: 14 IP, 3 R.
Stephen Drew: 2 for 4, 1 2B. He played a part in that sixth-inning rally. Moving the Needle: Jason Varitek busts it open with a homer, +.131 WPA. Fausto Carmona was looking good early on in this one, but he apparently tired down the stretch. That’s one way to excuse the homer that Varitek hit in the seventh inning. The two-run shot gave the Sox a 4-1 lead. Their pithing handled the rest. David Ortiz: 2 for 4, 2 2B. His wOBA is up to .396, which is a good deal higher than even last year’s. Josh Beckett: 6.2 IP, 5 H, 1 R, 3 BB, 6 K. With both Daisuke Matsuzaka and John Lackey on the shelf, the Sox need Beckett to step up. Good thing he’s been doing it all season. 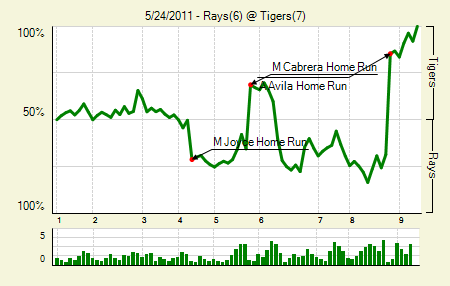 Moving the Needle: Alex Avila gives the Tigers the lead back in the eighth, +.540 WPA. The lead changed hands a few times early, but the Rays strung together three in the sixth, which seemed to put them in good standing. But then struck Avila. He hit a solo homer in the bottom of the sixth to bring the Tigers to within one. Then, in the eighth, with a runner on first and one out, he went the opposite way for a go-ahead homer. Joaquin Benoit, recently demoted from a setup role, pitched a scoreless ninth. Miguel Cabrera: 1 for 4, 1 HR. His three-run shot gave the Tigers a lead earlier in the game. Matt Joyce: 3 for 4, 1 HR. He leads all major-league left-handers in wOBA (.462). Moving the Needle: Jerry Sands hits a granny, +.267 WPA. The Dodgers jumped all over the Astros early in this one, homering twice and scoring five runs in the first three innings. Sands absolutely destroyed the grand slam, a shot well over the 401 sign in center field at Minute Maid Park. The Astros finally got their own offense going in the bottom of the third, but it wasn’t enough to overcome the early deficit. Jay Gibbons: 1 for 3, 1 HR. His first homer of the season was the Dodgers’ first run of the game. Hunter Pence: 2 for 4, 2 2B. He did his best, but it’s tough to win when the 6-7-8-9-1 hitters in your lineup go 0 for 17 with just one time on base among them. 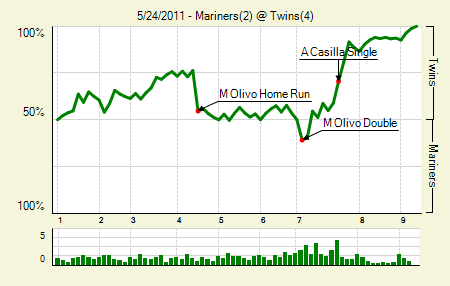 Moving the Needle: Miguel Olivo ties the game with a two-run blast, +.217 WPA. There was little doubt, once the ball left the bat, that Olivo’s swing had tied the game at two. 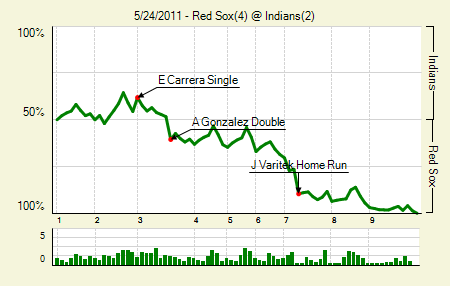 What turned out to be the biggest play, though, was when Doug Fister balked with a man on third base. You don’t wanna do that. 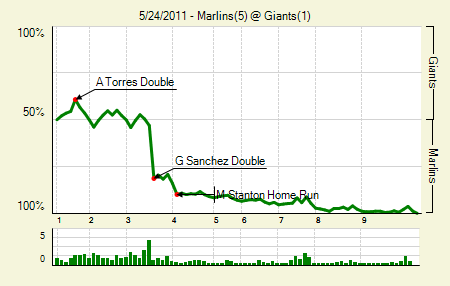 The Twins took the lead back on that, and the batter at the plate, Denard Span, doubled home the runner for a 4-2 lead. Nick Blackburn: 9 IP, 7 H, 2 R, 0 BB, 6 K, 16 GB, 1 HR. His last five starts: 36.2 IP, 28 H, 8 R, 11 BB, 21 K, 60 GB. Denard Span: 3 for 4, 1 2B, 1 3B. A homer short of the cycle — though he did hit that homer in the previous game. Moving the Needle: Curtis Granderson brings home the tying run in the ninth, +.393 WPA. For the Yankees it was a long road back. The Blue Jays went up 4-1 in the fourth, but CC Sabathia retired the final 16 straight to complete the game. That left it in the hands of the Yanks’ offense, which failed with runners in scoring position in the sixth and seventh. 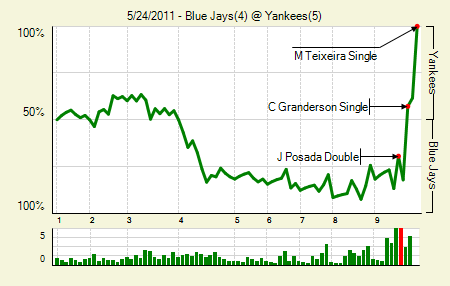 In the eighth the Yanks got a boost when Granderson and Robinson Cano doubled. With the score 4-3 in the bottom of the ninth, Granderson singled home the tying run, stole second, and then scored the winning run on a single that deflected off the first baseman’s glove. All in all Granderson was 3 for 5 in the game. Juan Rivera: 2 for 4, 1 2B. It should have been two doubles, but he’s slow. Also, the game-winning hit deflected off his glove at first. Jorge Posada: 1 for 1, 2B. 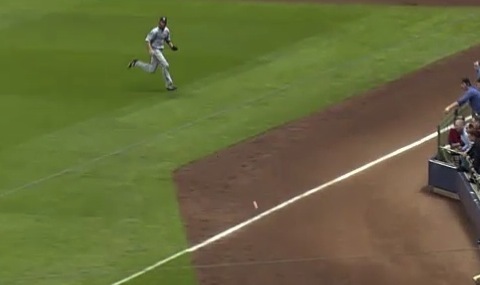 The double is generous, since the ball was bobbled a bit in the outfield. For a guy who has gotten off to a disappointing start, this ninth-inning hit was as big as they come. 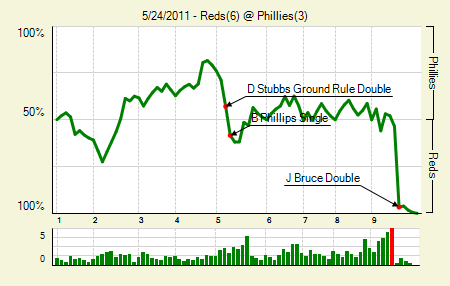 Moving the Needle: Jay Bruce breaks the tie in a big way, +.431 WPA. The score had been tied at three since the fifth, though the Phillies did have a few chances to plate the go-ahead run. The Reds held them each time, which gave the Reds a chance in the ninth. With two outs and the bases loaded, Bruce came to the plate. Ryan Madson’s pitched tailed right over the middle of the plate, and Bruce hit it off the scoreboard in right for a bases-clearing double that put the Reds up three. Raul Ibanez: 3 for 4, 1 2B. Fire, thy name is Ibanez. Joey Votto: 2 for 3, 1 2B, 2 BB. It’s just a constant stream of output from Votto. Moving the Needle: Carlos Quentin hits a three-run bomb, +.235 WPA. 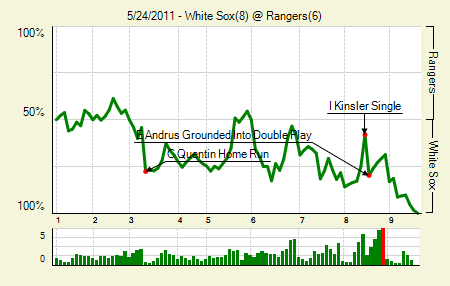 I would say that the White Sox had an impressive eight-run outburst, but, really, it was a Quentin outburst. He crushed three homers in the game, including a three-run shot in the third that broke a 1-1 tie. That was a mammoth homer, going way deep between the foul pole and the second tier. Even his last homer was meaningful, as it extended the Sox lead to two in the ninth. Quentin now has 12 on the year, which ties him for third in the majors. Elvis Andrus: 2 for 5, 1 2B. Alex Rios: 2 for 3, 1 2B, 1 BB. That was his first multi-hit game since May 8. 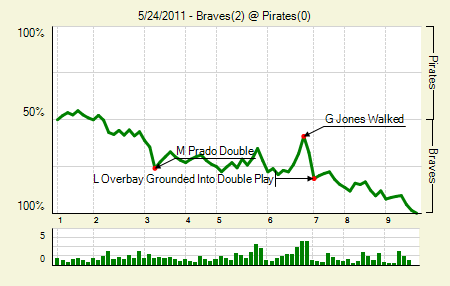 Moving the Needle: Martin Prado extends the Braves lead with a double, +.113 WPA. Pitching and defense ruled this one, which means that RBI doubles, such as Prado’s in the third, make all the difference. It was just a bouncer down the third base line, but it was enough to score Jordan Schafer from first. That concluded the scoring in the game. Charlie Morton: 7 IP, 7 H, 2 R, 3 BB, 4 K, 16 GB. A valiant effort to be sure, but with absolutely no offensive support it was for naught. Jair Jurrjens: 7.2 IP, 6 H, 0 R, 1 BB, 4 K, 10 GB. He he hasn’t walked more than one batter in a game since April 26th. Four times now he’s held opponents to zero or one runs. 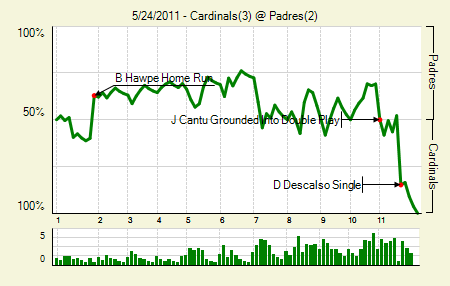 Moving the Needle: Daniel Descalso brings home the go-ahead run in the 11th. He did it again. Yesterday Descalso topped the WPA list with a big hit, and again he came through for the Cards. With two outs and a runner on second in the 11th, he hit one sharply up the middle. It deflected off Orlando Hudson’s glove and into center, allowing the go-ahead run to score easily. Brad Hape: 1 for 4, 1 HR. That’s his third straight game with an extra base hit. His offensive numbers are still pretty putrid, but considering his start they’re starting to look decent. Aaron Harang: 7 IP, 8 H, 2 R, 1 BB, 7 K, 13 GB. That should have been good enough for the Pads, but with that offense you never know. Moving the Needle: Gaby Sanchez clears the bases with a double, +.283 WPA. It’s not every day that you get a bases loaded opportunity in the third against Matt Cain — and especially when it comes because he walked two straight batters. Sanchez doubled deep into the right-center field gap, and was lucky that a fan didn’t touch the ball. It plated all three runners and staked the Marlins to an early lead. Mike Stanton: 1 for 3, 1 HR, 1 BB. I guess the hammy is fully healed. If you were starting a team today, would you rather have Stanton or Jason Heyward? I’d have a hard time not picking Stanton. Ricky Nolasco: 8.1 IP, 7 H, 1 R, 2 BB, 5 K. The strikeouts haven’t been there this year, but he’s putting together a quality season. He’s allowed more than three runs only twice in 10 starts. We hoped you liked reading The Morning After: Game Recaps for May 24th by Joe Pawlikowski! The Brewers are crushing teams.